CD review: "The Complete Blue Note Fifties Sessions" and "Introducing"
These reviews first appeared in the March 22, 1996 issue of the North County Times. Lee Morgan was on the fast track to jazz greatness  playing with Dizzy Gillespie at 18, a star of Art Blakey's Jazz Messengers at 20, hailed as the next giant of trumpet, heir to Louis and Miles. But by 35, he was dead of a gunshot wound in a New York nightclub. In the 15 year between, though, he laid down some phenomenal jazz  much of which is newly available on CD. (His performances with the 1960 edition of the Jazz Messengers were issued two years ago on Mosaic Records under Blakey's name.) Two new CDs showcase Morgan's early recordings as a leader. Mosaic has put together all of Morgan's Blue Note sessions from the 1950s as leader, and the newly reconstituted Savoy label has reissued Morgan's solo debut. 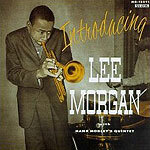 Morgan had a distinctive, fat tone  influenced by his mentor, Gillespie, but mellower, sweeter. He played straight-ahead, often boppish jazz with incredible energy. And Morgan (or his producers) had a knack for gathering top-notch talent for his recording dates: players such as saxophonists Hank Mobley and Benny Golson, drummers Art Taylor and Philly Joe Jones, and pianists Hank Jones and Bobby Timmons. The results on both the Mosaic box set and the more affordable Savoy release are remarkable: Passion coupled to vision, all of it rendered with taste, class and elegance.